Application Binary Interface (ABI) stability is a prerequisite of framework-only updates because vendor modules may depend on the Vendor Native Development Kit (VNDK) shared libraries that reside in the system partition. Newly-built VNDK shared libraries must be ABI-compatible to previously released VNDK shared libraries so vendor modules can work with those libraries without recompilation and without runtime errors. To help ensure ABI compatibility, Android 9 includes a header ABI checker, as described in the following sections. The VNDK is a restrictive set of libraries that vendor modules may link to and which enable framework-only updates. ABI compliance refers to the ability of a newer version of a shared library to work as expected with a module that is dynamically linked to it (i.e. works as an older version of the library would). Exported by the public headers of a shared library. Appears in the .dynsym table of the .so file corresponding to the shared library. Has WEAK or GLOBAL binding. Visibility is DEFAULT or PROTECTED. Section index is not UNDEFINED. Type is either FUNC or OBJECT. The public headers of a shared library are defined as the headers available to other libraries/binaries through the export_include_dirs, export_header_lib_headers, export_static_lib_headers, export_shared_lib_headers, and export_generated_headers attributes in Android.bp definitions of the module corresponding to the shared library. bool Return type of Foo. int Type of first Foo parameter. bar_t * Type of second Foo parameter. By way of bar_t *, bar_t is exported through foo_exported.h. int : is the type of m1. int * : is the type of m2. foo_private_t * : is the type of mPfoo. A similar explanation can be given for types reachable through base class specifiers and template parameters as well. Change resulting in the change of the size of the class/struct. Change resulting in a change in the v-table layout. Changing the order of base classes. Change resulting in a change to memory offset of a data member**. Change in the const-volatile-restricted qualifiers of a member*. Downgrading the access specifier of a data member*. Change which results in the change in the size. Changing the order of fields. Changing the value of a member. Changing the name of a member. Removing symbols exported by public headers. Changing the type of any parameter in any way. Changing the return type in any way. Changing the corresponding C/C++ type in any way. ** Not restricted to changes in offsets of public fields (as inline functions could use private fields internally). * While these do not represent a change in the memory layout of the type, they are semantic differences that could lead to libraries not functioning as expected. header-abi-dumper processes the source files compiled to build the VNDK library (the library's own source files as well as source files inherited through static transitive dependencies), to produce .sdump files that correspond to each source. header-abi-linker then processes the .sdump files (using either a version script provided to it or the .so file corresponding to the shared library) to produce a .lsdump file that logs all of the ABI information corresponding to the shared library. 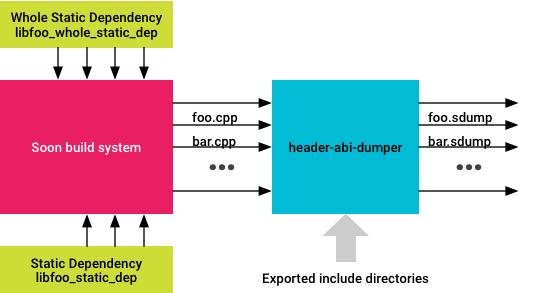 header-abi-diff compares the .lsdump file with a reference .lsdump file to produce a diff report that outlines the differences in the ABIs of the two libraries. The header-abi-dumper tool parses a C/C++ source file and dumps the ABI inferred from that source file into an intermediate file. The build system runs header-abi-dumper on all compiled source files while also building a library that includes the source files from transitive dependencies. Currently .sdump files are formatted as Protobuf TextFormatted, which is not guaranteed to be stable across future releases. As such, .sdump file formatting should be considered a build system implementation detail. record_types. Refer to structs, unions, or classes exposed by the public headers. Each record type has information about its fields, its size, access specifier, the header file it was exposed in, etc. pointer_types. Refer to pointer types directly/indirectly referenced by records/functions exposed by public headers, along with the type the pointer points to (via the referenced_type field in type_info). Similar information is logged in the .sdump file for qualified types, built-in C/C++ types, array types, and lvalue and rvalue reference types (such logging information about types allows for recursive diffing). functions. Represent functions exposed by public headers. They also have information about the function's mangled name, the return type, the types of the parameters, the access specifier, etc. Tip: To get help with the header-abi-dumper tool, run header-abi-dumper --help. A file that logs the ABI of a shared library (e.g. libfoo.so.lsdump represents libfoo's ABI). The tool merges the types graphs in all the intermediate files given to it, taking into account one-definition (user-defined types in different translation units with the same fully qualified name, might be semantically different) differences across translation units. The tool then parses either a version script or the .dynsym table of the shared library (.so file) to make a list of the exported symbols. Links the .sdump files provided to it (foo.sdump and bar.sdump), filtering out the ABI information not present in the headers residing in the directory: exported. Parses libfoo.so, and collects information about the symbols exported by the library through its .dynsym table. libfoo.so.lsdump is the final generated ABI dump of libfoo.so. Tip: To get help with the header-abi-linker tool, run header-abi-linker --help. The header-abi-diff tool compares two .lsdump files representing the ABI of two libraries and produces a diff report stating the differences between the two ABIs. .lsdump file representing the ABI of an old shared library. .lsdump file representing the ABI of a new shared library. A diff report stating the differences in the ABIs offered by the two shared libraries compared. The ABI diff file is designed to be as verbose and readable as possible. The format is subject to change in future releases. For example, you have two versions of libfoo: libfoo_old.so and libfoo_new.so. In libfoo_new.so, in bar_t, you change the type of mfoo from foo_t to foo_t *. Since bar_t is a directly reachable type, this should be flagged as an ABI breaking change by header-abi-diff. type_stack: "Foo-> bar *->bar "
The size of the record changing from 24 bytes to 8 bytes. The field type of mfoo changing from foo to foo * (all typedefs are stripped off). 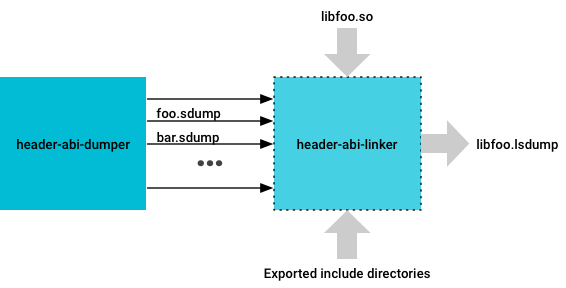 The type_stack field indicates how header-abi-diff reached the type that changed (bar). This field may be interpreted as Foo is an exported function that takes in bar * as parameter, that points to bar, which was exported and changed. Tip: To get help with the header-abi-diff tool, run header-abi-diff --help. You can also refer to development/vndk/tools/header-checker/README.md. After creating the references, any change made to the source code that results in an incompatible ABI/API change in a VNDK or LLNDK library now results in a build error.